The second study day hosted by the MALMECC project (2nd November 2018) was devoted to the phenomenon of translingualism, in our case how phenomena—be they concepts like courtliness, musical or literary forms, or for that matter individuals themselves—pass between linguistic zones. Exchanges across linguistic frontiers and the effect that the knowledge of multiple languages can have on someone’s cultural production are topics of central importance to the work of the MALMECC team. As such, we were delighted to be able to discuss these and related questions with a range of expert interlocutors representing the fields of medieval music, art, and literature in German, French, Dutch, English, Occitan, Catalan, Welsh and, of course, Latin. 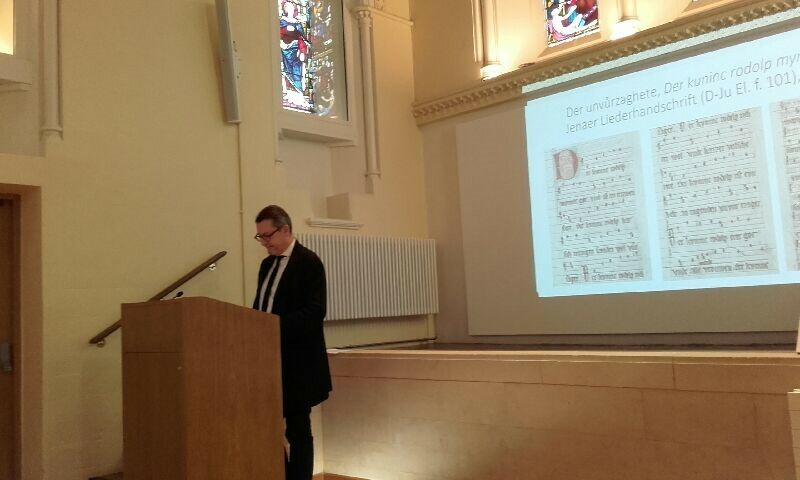 After words of welcome from MALMECC’s Principal Investigator, Karl Kügle, Frank Willaert opened proceedings with a rich and wide-ranging paper entitled ‘Hovedauncis and rés d’Alemaigne’. It took as its starting point Machaut’s knowledge of the German-language song repertory of the thirteenth century, crystalized in his mention of a rés d’Alemaigne on which he claimed to have based the ballade ‘N’es qu’on porroit’ in Le Voir Dit. From there, Prof. Willaert traced the spread of Germanic songs, music, and musicians throughout later medieval Europe. He covered not only the massive demand for German wind and brass instrumentalists—Philip the Bold, Duke of Burgundy and Gaston Fébus both retained a number of them, while Wenceslas IV, King of the Romans loaned his German ‘King of the Minstrels’ to favoured servants—but also the spread of songs of Low German origin, principally the virelais-ballade along the Rhein. From the 1380s, there emerged a trend for pieces labelled ‘hovedaunce’ or ‘hovedans’ in both Low German sources such as the Hague songbook and also in the writing of English authors Chaucer and Gower, the first of whom may have come into contact with these pieces via the Rhenish musicians of his patron John of Gaunt. Prof. Willaert’s paper demonstrated vividly the wide horizons of the medieval court, as well as the benefits of comparative study on the basis of medieval, not modern, geographies both in terms of linguistic areas and the cultural spheres which did not necessarily overlap. 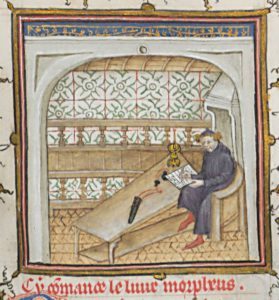 Machaut writing the Morpheus, with which he says he sent Ballade 33 to Toute Belle. MALMECC’s own Karl Kügle, in his paper, ‘A song about the Porridge King and Machaut’s B33 re-visited’, took the lead from Prof. Willaert’s paper in pursuing the topic of Germanic influences on Machaut. In it he pursued a possible source for Ballade 33 in Le Voir Dit, namely the song ‘Der kuninc Rudolp’ by the German Sangspruchdichter known as ‘Der Unverzagte’ [‘The Unrelenting’] about the Habsburg duke Rudolf I. This German piece satirizes the infant duke, a contender for the imperial throne, and therefore an enemy of Machaut’s Luxmburg patron, the blind King John of Bohemia. Kügle demonstrated in detail how the peculiar compositional practice that lies behind the French piece can be traced back to the extreme melodic economy of the German Spruch, indicating the exciting possibility that Machaut, as well as his recognised knowledge of the French trouvère repertory, was also acquainted with at least some song in German. Conversation after the paper circled around the nature of artistic influence and parody, as well as poets’ claims to novelty in this context. David Murray, post-doc on the MALMECC team, focussed on two aspects of translingual transfer in the corpus of the anonymous composer the Monk of Salzburg. First, the adoption of the melody of the French chace ‘Umblemens vos pri merchi’ for his three-part canon ‘Iu, ich jag’ bears witness to the years spent by the Monk’s patron, Archbishop Pilgrim von Puchheim, at the Papal court in Avignon. The German song itself later became the model for a Latin song praising the Virgin Mary. In the second half of his paper, Murray proposed a new social context for the adoption of the virelai-ballade form at the archiepiscopal court of Salzburg, long thought of as evidence of the influence of Machaut via the connections between Salzburg and Prague, where the French composer spent more than a decade as secretary to King John of Bohemia. 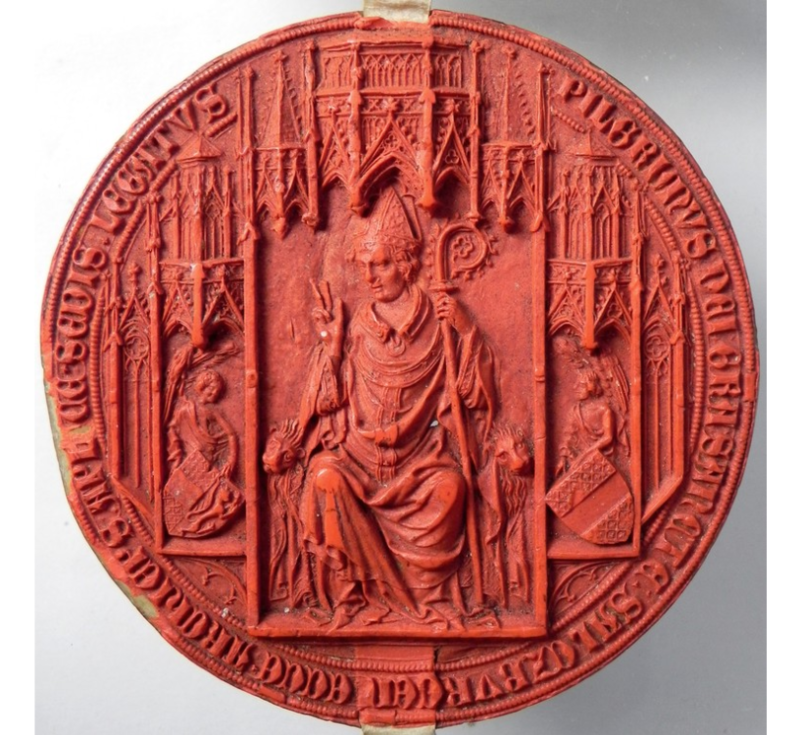 Instead, he suggested that the form enjoyed particular prominence in the circle around Leopold III of Habsburg, a close political partner of Archbishop Pilgrim. Discussion of this paper focused on the nature of the exchanges between the sacred and the profane realms and the value of poetic and musical form (including the relative status of polyphony and monophony in corpora that have both) in the transmission of cultural goods. The last speaker, Elizabeth Eva Leach, presented a fascinating paper on an episode at the beginning of the Old French romance Le Tournoi de Chauvency, in which a German knight, the literary version of the real Konrad II von Hattstatt, Landvogt of Upper Alsace, is shown speaking amusingly bad French. What were the stakes of language use in courtly encounters—and how could medieval authors represent the grey-zones generated by non-native language use? The manuscript transmission of Chauvency hints at some of the potential difficulties, as one of the two surviving witnesses smooths out the German noble’s French, suggesting that certain recipients did not get the joke. Conversation also covered the rarity of such moments of ‘foreign’ language use in Middle High German texts and the particular snobbery among non-native French speakers (for example Gerald of Wales) about the quality of their French. Prof. Leach had also presented a paper on the motets in the manuscript Oxford, Bodleian Library, Douce 308 at the Medieval and Renaissance Music seminar at All Souls College the evening before the workshop. An early fourteenth-century witness to the musical and literary culture of the sometimes liminal region of Lorraine, Douce 308 provided a highly suitable prelude to the workshop. All in all, the workshop encouraged further thinking about the nature and stakes of translingual exchanges, as well as the many different levels on which they occur. One theme that emerged, and which perhaps requires more thinking, is the status of individual languages for their medieval users (notably French and Latin) and the value attributed to them in trans- and intralingual contexts such as major courtly gatherings. Better understanding of this linguistic landscape will provide a firmer footing for the investigation of what it is the medieval poets and composers we study actually did when they reached (across) linguistic frontiers. 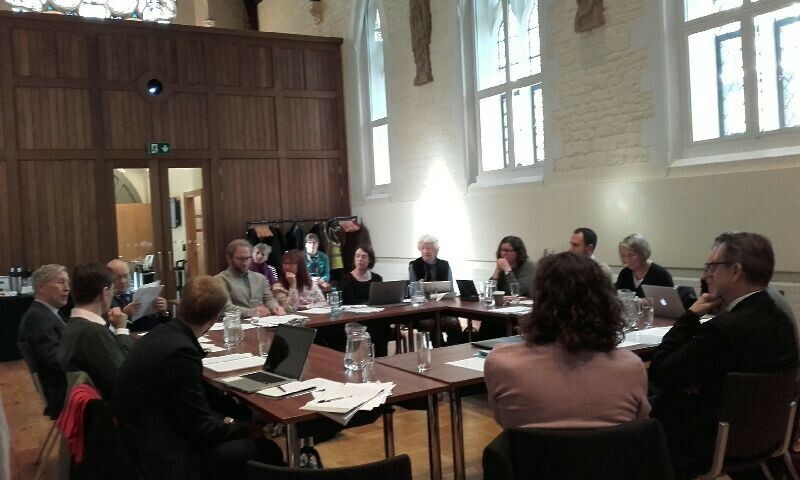 All the participants (both speakers and discussants) gave compelling instances of the need for a more ‘joined-up’ approach to medieval cultural activities, and the members of the MALMECC project look forward to making their contribution to this cause in the future stages of the project. The MALMECC team is very grateful to all those who attended and participated in the workshop (especially to Frank Willeart, who travelled from Antwerp to join us) for their contributions to what was a highly stimulating event. Thanks are also due to the MALMECC project administrator Martha Buckley for her role in ensuring the smooth running of the event both in preparation and on the day. Stay tuned for further details of our next workshop, ‘Avignon the Italian’, to be held in February 2019.